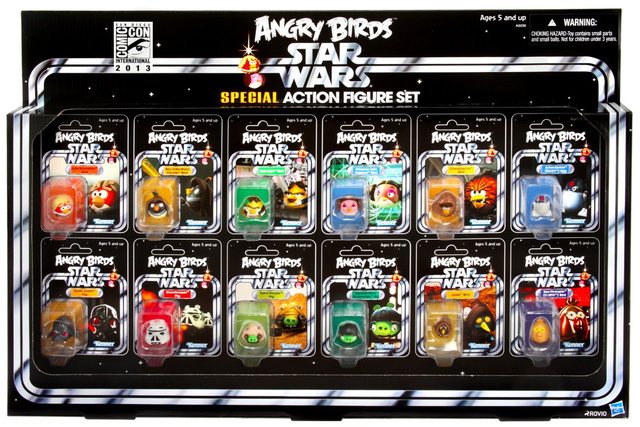 MTV Geek released information today for yet another San Diego Comic-Con exclusive. If you’re into creepy dolls, then these are perfect for you. As the world of fandom collectively counts down to the July 18th start of San Diego Comic-Con International 2013, Mezco adds fuel to the flames of excitement by revealing the details of one of their Summer Exclusives:Living Dead Dolls Resurrection Series 7-Variant Edition! The Living Dead Dolls Resurrection Set claws its way from the grave for 2013.The latest dolls to be reimagined for the collection are: Revenant, Dahlia, Lust, & Killbaby. All four feature glass-like eyes that seem to peer into your very soul. Each member of this limited edition quartet of the damned comes with its own death certificate, and entombed in its own coffin. I came across this while lurking about Cosplay.com. If you plan on attending Comic-Con as Harley Quinn you might want to check this out. If you have questions please be sure to direct them to the people in charge of the event! Harleypalooza is an annual tradition started by Elise Archer in which the many Harley Quinn cosplayers (as well as their Puddins, Reds, kitties and Batbrains) who attend SDCC gather together in a group for pictures, laughter and general fan geekiness! Last year we had a large photoshoot, the “running of the Harleys” and crashed the Batmobiles location for some fun. In previous years we have participated in protests and been graced with Paul Dini’s amazing presence! Please, invite all Harleys, Jokers, Poison Ivys and any other Bats and Rogues you can think of who will be attending SDCC! According to Facebook Event Page, the group has normally gathered on Saturday but they’re open to suggestions. I’m sure as it gets closer to the event they’ll have a better idea of the time and place. The photo is done outside the convention though that way even those without a badge can take part! Of course all versions of Harley are welcome. To learn more be sure to check out the Facebook page! 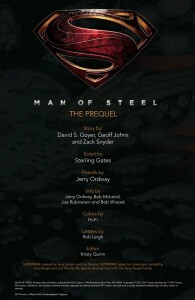 During Walmart’s screening presale on May 18th, to lucky people who purchased tickets were given a Man of Steel prequel comic. The comic is now online and can be viewed HERE. But, be warned…there are spoilers in those comic cells. 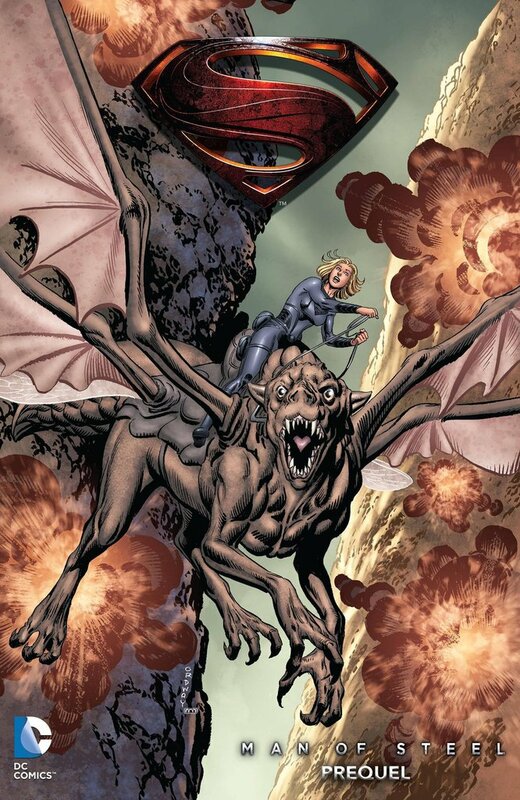 And even though I’m pretty certain we won’t see much, if any of, Supergirl (Kara Zor-El) in the upcoming film, this gives us a little glimpse into a possible sequel to the film. Check out some of the the comic pages below, see the full comic HERE, and again You Have Been Warned of Possible Spoilers!! 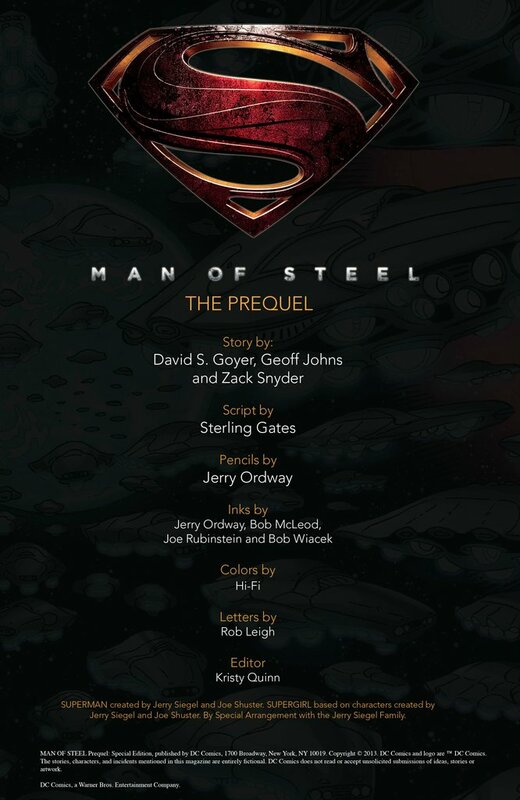 If you’re a fan of DC, the writing of David S. Goyer, and the direction of Zack Snyder (300, Watchmen, Sucker Punch), then I think you will be in for a treat with Man of Steel. The recent Batman films have set a new bar in the world of DC comic movies. As long as they can maintain that type of dark and detailed story telling, we will all be happy film goers. Check out the trailer below for “Fate of your Planet” to see some of the correlation between the Prequel Comic and Man of Steel. The shots are edited for a quick view, but you can easily see the skeletal remains and the ship of Kara Zor-El. According to MovieTalk on Yahoo!, Jamie Foxx (and most likely many more cast members) will be heading to San Diego Comic-Con this summer to promote the next Amazing Spider-Man movie. I expect Jamie to bring some high energy to the panel. 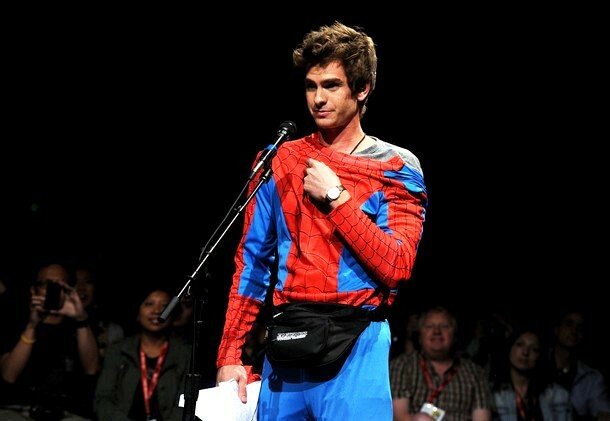 He strikes me as someone who could be amazed at the energy and craziness of Hall H and feed off of it. So, are you ready to get in line? Latino Review has info stating that the Spider-Man panel will be on Friday, July 19th and will be part of the Sony Pictures Hall H panel. 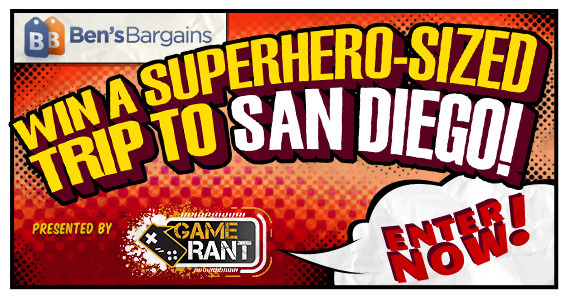 Game Rant is giving away a super-sized trip to San Diego Comic-Con 2013. What does it include? Once you’ve entered our superhero-sized giveaway, you’ll instantly be eligible for each and every weekly giveaway. The prize of the week will be announced every Monday @ 12 p.m., and the winner will be selected by Friday @ 5PM (PST) and announced at 5:30PM (PST). You must be 18+ and live in the U.S. in order to enter. If you get friends to enter you’ll earn extra entries. What are you waiting for? Go enter! Flanigan had guest roles in numerous television series including Profiler, First Monday, and Sisters, until he got his breakthrough with his role on Stargate Atlantis as Lt. Colonel John Sheppard. 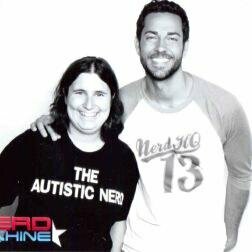 He lived in Vancouver, Canada, where the series was filmed during the week, and flew to Los Angeles during the weekends where his wife and children resided. He additionally wrote for the series and created the stories for the Stargate Atlantis second season episode “Epiphany” and the fourth season episode “Outcast”. 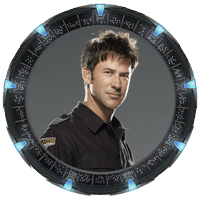 Sheppard and Rodney McKay (David Hewlett) are the only characters to appear in every episode of the series.For more information on Joe Flanigan, click here to view his imdb profile. Luttrell’s training in dance and music naturally led her to the stage. She made her professional début in Canada’s Premier Production of Miss Saigon in Toronto and the Premier Canadian Production of Disney’s Beauty And The Beast in Toronto. She would go on to appear in many other stage productions, such as Once On This Island, Goblin Market, and the premier performance of Pulitzer Prize–winning playwright Lynn Nottage’s Las Meninas. She ventured to The UK and studied at the British American Drama Association on a midsummer course at Balliol College, Oxford. Shortly after her return to Los Angeles, Luttrell was cast in her most high-profile role to date, as Teyla Emmagan on Stargate Atlantis. In 2011 Luttrell released her debut Jazz album “I Wish You Love”, which was produced by Austrian record producer Gerrit Kinkel and features Jazz greats like Jeff Hamilton, Jennifer Leitham, Graham Dechter and Konrad Paszkudzki. She was considered for the role of Storm in X-MenFor more information on Rachel Luttrell, click here to view her imdb profile. Martin Wood began his television career in 1995. Although he is best known for his work on the Stargate franchise’s Stargate SG-1 and Stargate Atlantis, he has also directed for many other television series, including The Invisible Man and Earth: Final Conflict. In addition, Martin directed two TV specials on sudden infant death syndrome.Along with Peter DeLuise, Andy Mikita and Will Waring, Wood was one of Stargate SG-1’s main directors during its 10 year run. 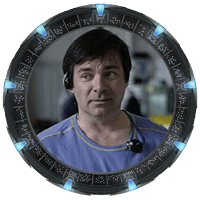 He also frequently appears as an extra known as “Major Wood” in the Stargate SG-1 episodes that he directs, often assisting Sergeant Siler as a repairman using the oversized crescent wrench that serves as an inside joke. He is also featured on many Stargate SG-1 and Stargate Atlantis DVD special features, such as featurettes and audio commentaries. Currently, Wood is the director for the science-fiction series Sanctuary, starring Amanda Tapping and Christopher Heyerdahl. For more information on Martin Wood, click here to view his imdb profile. Patrick Currie is best known for playing Fifth the Human Replicator in Stargate SG1. 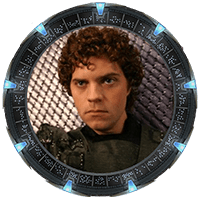 He has however also played the Unas Chaka, as well as the character Eamon also in Stargate SG1. Patrick also played Enzo in the New Battlestar GalacticaFor more information on Patrick Currie, click here to view his imdb profile.